I had a great weekend! Saturday my wife and I headed to a nutrition specialist (not an “RD” mind you – there aren’t many of those whom we will trust) to discuss the proper nutritional supplements that each of us should be taking, given our current diet and lifestyle, in order to support our continued personal health and growth. The rest of the weekend was a rest weekend, with a couple of really solid workouts – I did more than 12 miles on Sunday, with some decent strength training to boot! And on to the food… I’ve done a lot of salad posts lately. And I’m sure most of you know this already, but I eat a lot of salads. Hot&Cold Salads, regular salads, side salads, UPC Twisted Salads – you name it! So, to break the monotony a bit, today’s post is only half about the salad! Start the Steak first. Put the steak in a covered frying pan with the coconut oil on top of it (not in the pan, on top of the steak). Turn the heat on to medium-low, about 2.5 out of 10, and let it cook, covered, for at least 15 minutes. The Coconut Oil will melt slowly, running down over the steak and keeping the entire thing moist and delicious! After about 15 minutes, flip the steak. When you flip it, make sure to rub the bottom, now top of the steak around in the coconut oil, so that it’s not dry on top, then put the cumin and Italian seasoning on the steak, covering again to let it cook. Start the carrots at the same time as starting the steak. Slice them with fairly thick slices – the cooking process will soften them nicely, so you don’t have to worry too much about them being difficult to chew. Put them in a covered pan and cook them on medium-low heat, covered (again, 2.5 out of 10). Put the coconut oil in with the carrots, and lightly sprinkle the cumin along the top of the carrots. These need to cook at a low temperature because you’re not going to flip these – they stay with one side down and roast slowly with the cumin on top of them. Since you don’t want to flip the carrots, I do not recommend putting them in the same pan as the steak the first time you try this. But it’s a great way to share the flavors after you’re comfortable with using the same pan! 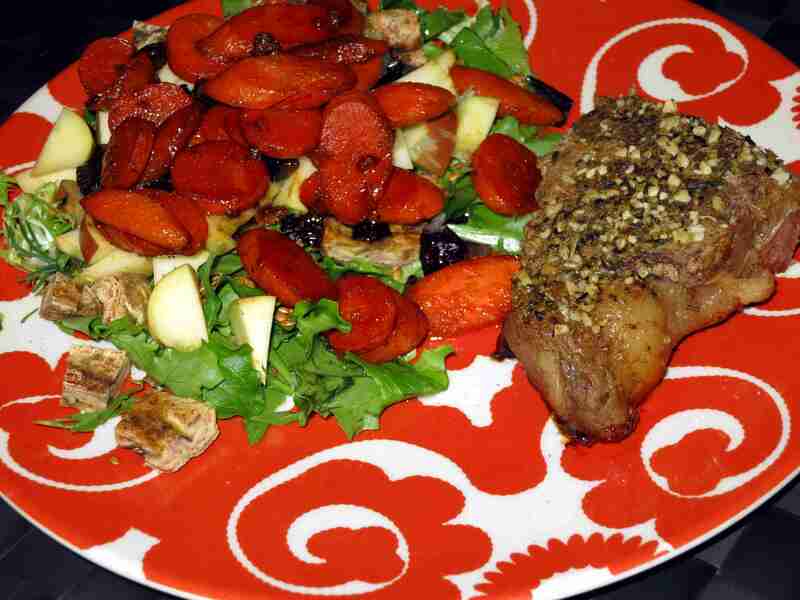 While the steak and carrots are cooking, chop up the rest of the Salad and get it ready on the plate. I like to be particular with where I squeeze the lime over the salad. I think that some ingredients taste better when they’ve had a longer exposure to the lime juice, so I like to make sure those ingredients are on top when I add the lime. So chop the salad and apples first. Then add the mushrooms and prunes on the top, so that the mushroom and prunes would be exposed to the lime juice first. 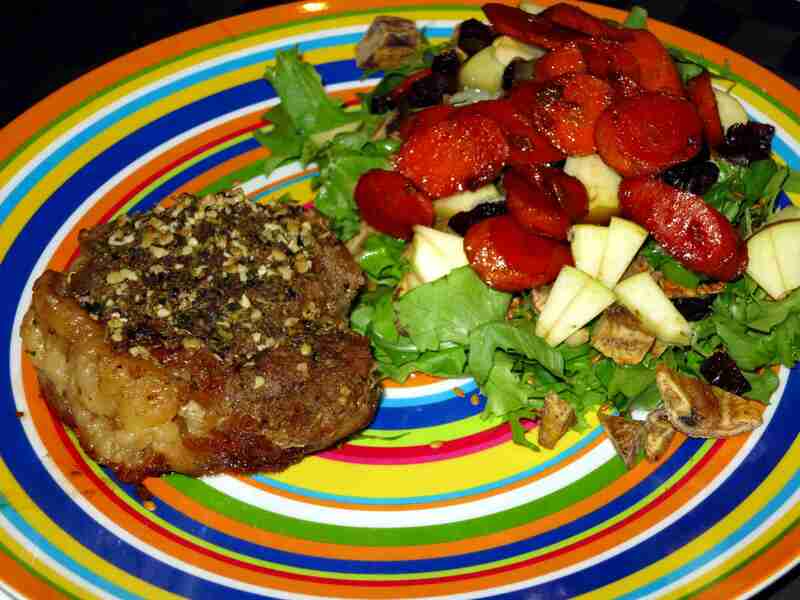 Squeeze the lime juice over the salad, and let it sit without mixing it until the steak and carrots are done. With tongs, take the carrots out of the pan and add them to the salad. These should be lightly coated with the oil of the pan, which is a good thing since we’re not adding any other oil to our salad. After adding the carrots to the salad, go ahead and toss the salad with the tongs on the plate. Last, add the steak and serve piping hot! And, as usual: Enjoy! Comments, suggestions and requests are all welcome on the comment board! Please write in if you’ve got anything you’d like to see, hear, or have me cook! This sounds soooo good. I’m in love with cumin! Healthy and delish!! Thanks Carl! I really enjoy my cumin too – that and turmeric!